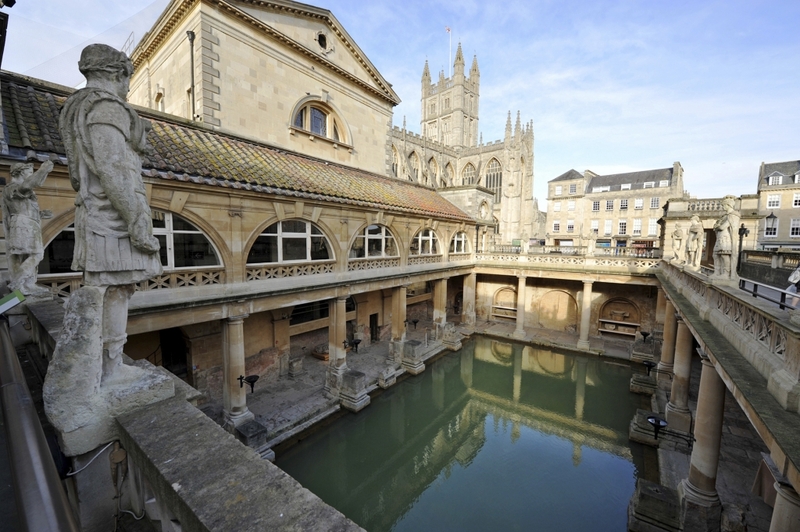 The process of extracting natural gas from underground sources could pose a real threat to the World Heritage Site of the famous Roman Baths of Aquae Sulis in Bath, England. Concerns were raised by Bath and North-East Somerset council, who fear that test drilling pockets of shale gas using a method known as “fracking” could harm the spings. Shale gas is natural gas produced from shale (a fine-grained, clastic sedimentary rock composed of mud and a mixture of flakes, clay minerals and tiny particles). Shale gas has become an increasingly important source of natural gas in the United Kingdom. Fracking is the process of initiating and subsequently propagating a fracture in a rock layer, by means of a pressurized fluid, in order to release petroleum, natural gas, coal seam gas, or other substances for extraction. The fracturing, known colloquially as a frack job is done from a wellbore drilled into reservoir rock formations. The energy from the injection of a highly pressurized fluid, such as water, creates new channels in the rock which can increase the extraction rates and ultimate recovery of fossil fuels. Bath and North-East Somerset council announced that two companies were applying to Mendip district Council for permission to test drill for gas using this highly controversial method. The practice of hydraulic fracturing has come under scrutiny internationally due to concerns about environmental and health safety, and has been suspended or banned in many countries including parts of the United States. Councillors in Bath fear that the water course which supplies the geothermal springs of the Roman Baths and “Pump House” could be contaminated as the fracturing process could lead to new inclusions being introduced into the unique properties of the spa waters, in addition to change the direction of the water flow through underground fractures in rock. “Bath and North-East Somerset council has obtained the very best expert advice on this matter and there is little to suggest that any thought has been given to the potential for damage to the deep water sources that supply the springs in Bath. The water which bubbles up from the ground in the hot springs at Bath fell as rain on the nearby Mendip Hills. It percolates down through limestone aquifers to a depth of between 2,700 metres (8,900 ft) and 4,300 metres (14,100 ft) where geothermal energy raises the water temperature to between 64 °C (147.2 °F) and 96 °C (204.8 °F). Under pressure, the heated water rises to the surface along fissures and faults in the limestone. This process is similar to an artificial one known as Enhanced Geothermal System which also makes use of the high pressures and temperatures below the Earth’s crust. Hot water at a temperature of 46 °C (114.8 °F) rises here at the rate of 1,170,000 litres (257,364 imp gal) every day, from a geological fault (the Pennyquick fault). The first shrine at the site of the hot springs was built by the Celts, and was dedicated to the goddess Sulis, whom the Romans identified with Minerva. Geoffrey of Monmouth in his largely fictional Historia Regum Britanniae describes how in 836 BC the spring was discovered by the British king Bladud who built the first baths. Early in the eighteenth century Geoffrey’s obscure legend was given great prominence as a royal endorsement of the waters’ qualities, with the embellishment that the spring had cured Bladud and his herd of pigs of leprosy through wallowing in the warm mud. The name Sulis continued to be used after the Roman invasion, leading to the town’s Roman name of Aquae Sulis (literally, “the waters of Sulis”). The temple was constructed in 60-70 AD and the bathing complex was gradually built up over the next 300 years. During the Roman occupation of Britain, and possibly on the instructions of Emperor Claudius, engineers drove oak piles to provide a stable foundation into the mud and surrounded the spring with an irregular stone chamber lined with lead. In the second century it was enclosed within a wooden barrel-vaulted building, and included the caldarium (hot bath), tepidarium (warm bath), and frigidarium (cold bath). After the Roman withdrawal from Britain in the first decade of the fifth century, these fell into disrepair and were eventually lost due to silting up and flooding The Anglo-Saxon Chronicle suggests the original Roman baths were destroyed in the 6th century. The baths have been modified on several occasions, including the 12th century when John of Tours built a curative bath over the King’s Spring reservoir and the 16th century when the city corporation built a new bath (Queen’s Bath) to the south of the Spring. The spring is now housed in eighteenth century buildings, designed by architects John Wood, the Elder and John Wood, the Younger, father and son. Visitors drank the waters in the Grand Pump Room, a neo-classical salon which remains in use, both for taking the waters and for social functions. Victorian expansion of the baths complex followed the neo-classical tradition established by the Woods. In 1810 the Hot Springs failed and William Smith opened up the Hot Bath Spring to the bottom, where he found that the spring had not failed but had flowed into a new channel. Smith restored the water to its original course and the Baths filled in less time than formerly.